The complete Orders of Battle for troops of the Army of the Potomac commanded by Brigadier General P G T Beauregard, Confederate States Army. Brevet Major & Captain P G T Beauregard, United States Corps Engineers, resigned at New Orleans, Orleans Parish, Louisiana, on 9 February, 1861, dated 20 February, 1861, and was ordered to Montgomery, Montgomery, Alabama, on 22 February, 1861. 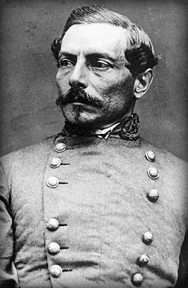 Major P G T Beauregard, Confederate States Army, arrived at Montgomery, Montgomery, Alabama, on 26 February, 1861, and was appointed brigadier general, Confederate States Army, on 1 March, 1861. Brigadier General P G T Beauregard, Confederate States Army, was ordered to proceed by the Montgomery & West Point Railroad to Charleston, Charleston District, South Carolina, the same day and arrived on 1 March, 1861. He was assigned to command the troops in and in the vicinity of Charleston Harbour between 3 March and 28 May, 1861, and was ordered to proceed by the Northeastern Railroad to Richmond, Henrico County, Virginia, on 29 May, 1861. Brigadier General P G T Beauregard, Confederate States Army, was accompanied by Major & Assistant Adjutant General D R Jones, Confederate States Army, and Colonels & Volunteer Aides J A Chisholm, T S Haymond, W P Miles, A G Rice, and J L Manning and arrived by the Richmond & Petersburg Railroad at Richmond, Henrico County, Virginia, at 1 PM on 31 May, 1861. He was assigned to command the Department of Alexandria by Major General R E Lee, Provisional Army of Virginia, at the Spotswood Hotel, on the southeast corner of Eighth and Main Streets, Richmond, Henrico County, Virginia, on 31 May, 1861, and was ordered to proceed by the Virginia Central Railroad to Manassas Junction, Prince William County, Virginia, in the morning on 1 June, 1861. Brigadier General P G T Beauregard, Confederate States Army, arrived by the Orange & Alexandria Railroad at Camp Pickens, Manassas Junction, Prince William County, via Gordonsville, Orange County, and Culpeper Courthouse, Culpeper County, Virginia, at 2 PM the same day. Brigadier General P G T Beauregard, Confederate States Army, was stationed at R Weir's Plantation or Liberia, three quarters of a mile north of Camp Pickens, Manassas Junction, Prince William County, Virginia, on the 3 June, 1861, and the Army of the Potomac was organised by General Orders No.20, Headquarters, Army of the Potomac, Camp Pickens, Manassas Junction, Prince William County, Virginia, on 20 June, 1861. Brigadier General P G T Beauregard, Confederate States Army, was assigned to command the Armies of the Potomac and Shenandoah on 21 July, 1861. Colonel P St G Cocke, Provisional Army of Virginia, was assigned to command the Department of Alexandria, at Alexandria, Alexandria County, Virginia, on 14 April, 1861, and was ordered to proceed by the Orange & Alexandria Railroad to Culpeper Courthouse, Culpeper County, Virginia, at 7 AM on 28 April, 1861 (See the Garrison at Alexandria). Major General M L Bonham, South Carolina Militia, was appointed a brigadier general, Confederate States Army, on 23 April, 1861, and arrived by the Richmond & Petersburg Railroad at Richmond, Henrico County, Virginia, at 6 PM on 24 April, 1861. He was assigned to command the Department of Alexandria and establish headquarters at Camp Pickens, Manassas Junction, Prince William County, Virginia, by Special Orders No.95, Headquarters, Virginia Forces, Richmond, Henrico County, Virginia, on 21 May, 1861, and arrived by the Orange & Alexandria Railroad at Camp Pickens, Manassas Junction, Prince William County, Virginia, on 23 May, 1861. Brigadier General P G T Beauregard, Confederate States Army, was assigned to command the Department of Alexandria on 31 May, 1861, and Brigadier General M L Bonham, Confederate States Army, was assigned to command the the troops stationed at Fairfax County, Virginia, and the 7th Virginia Infantry by Special Orders No. 1, Headquarters, Department of Alexandria, Camp Pickens, Manassas Junction, Prince William County, Virginia, on 4 June, 1861 (See the 7th Virginia Infantry). Boykin's Mounted Rangers was ordered to Manassas Junction, Prince William County, Virginia, on 17 July, 1861, and the 49th Virginia Infantry, Company A, on 18 July, 1861, and arrived at Camp Pickens, Manassas Junction, Prince William County, Virginia, on 21 July, 1861. The 6th South Carolina Infantry, the 30th Virginia Infantry, and the Westmoreland Cavalry were ordered to Manassas Junction, Prince William County, Virginia, on 20 July, 1861, and arrived at Camp Pickens, Manassas Junction, Prince William County, Virginia, on 21 July, 1861. The 9th Louisiana Infantry and the 13th North Carolina Infantry, Companies A, B, E, F, G, I, and K, were ordered to Manassas Junction, Prince William County, Virginia, on 21 July, 1861, and arrived at Camp Pickens, Manassas Junction, Prince William County, Virginia, the same day. The 1st Mississippi Battalion Infantry, Companies A, B, C, D, and E, were ordered to Manassas Junction, Prince William County, Virginia, on 20 July, 1861, and arrived at Camp Pickens, Manassas Junction, Prince William County, Virginia, on 22 July, 1861. Five companies of the 12th Mississippi Infantry and eight companies of the 12th Alabama Infantry were ordered to Manassas Junction, Virginia, on 21 July, 1861, and arrived at Camp Pickens, Manassas Junction, Prince William County, Virginia, on 22 July, 1861. The 9th South Carolina Infantry and the 3rd Georgia Battalion Infantry, Companies A, B, C, D, and I, were ordered to Manassas Junction, Prince William County, Virginia, on 23 July, 1861, and the 1st Texas Battalion Infantry on 3 August, 1861 (See Reserves, Army of the Potomac). The Army of the Potomac was redesignated the First Corps, Army of the Potomac, under the command of Brigadier General P G T Beauregard, on 25 September, 1861. The Army of the Potomac was assigned the Department of Northern Virginia by General Order 15, Adjutant & Inspector General's Office, Richmond, Henrico County, Virginia, on 22 October, 1861, and included the districts of the Valley, embracing the country between the Blue Ridge and Allegheny Mountains; the Potomac, consisting of the country between the Blue Ridge Mountains and the left bank of Powell's River; and Acquia, comprising the country between Powell's River and the mouth of the Potomac River, including the Northern Neck and the counties on each side of the Rappahannock River from its mouth to Fredericksburg, Virginia. The Army of the Potomac was redesignated the Army of Northern Virginia, under the command of General J E Johnston, on 14 March, 1862.